Last summer, the New Horizons spacecraft had everyone talking as it swept past Pluto, sending back tantalizing images of its surface. Now the mission's scientists have published a lot of material from their research. Five papers in the journal Science answer questions we've been holding onto about Pluto and its large satellite Charon (the name rhymes with "Sharon") since then. Questions like: What are they like? What are they made of? Pluto's neighborhood is pretty strange. First of all, conditions are extremely cold. The sun is so far away, it looks like an ordinary bright star. Temperatures are minus 370 degrees Fahrenheit in full sunlight. Everything out there is frozen solid, even things that are gases on Earth. Instead of Earth-type rocks made of silicon compounds, the rocks we see on Pluto and Charon are made of ices -- frozen water, nitrogen, methane and carbon monoxide. Yet in important ways, rocks and ices on Pluto act like rocks and ice on Earth. Take water ice. On Earth, water ice is soft enough to flow in the form of glaciers, but at Pluto's temperatures it's as rigid and brittle as stone. Pluto's other three ices, together referred to as volatile ices, are softer, like glacier ice on Earth. The three volatile ices mix easily with each other, but they also can be naturally separated since they evaporate and condense at slightly different temperatures. During the long seasons as Pluto-Charon circles the Sun once in 248 years, these volatile ices evaporate during summer. That thin breath of vapor makes up the atmospheres of Pluto and Charon. The vapors circulate and then condense as frost during winter. Over billions of years, this slow cycle has gently sculpted the icy landscapes into a great variety of forms. The big bright heart-shaped feature on Pluto, informally named Sputnik Planum, turns out to be a low-lying basin full of volatile ices. The ices slowly stir and circulate, erasing impact craters there within a few million years -- about as fast as craters are wiped out on Earth's rocky crust. 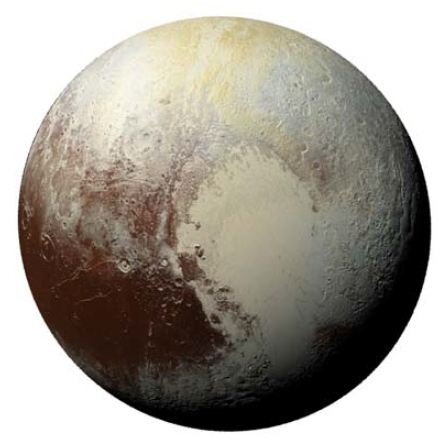 In that respect, Pluto is one of the most active places we know. 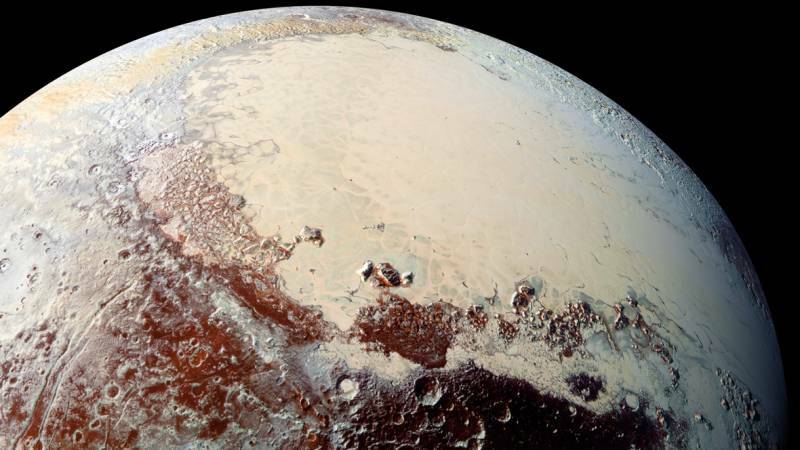 Yet other areas on Pluto are heavily cratered and appear to have surfaces as old as the solar system itself. Both Pluto and Charon also have evidence of deeper activity. 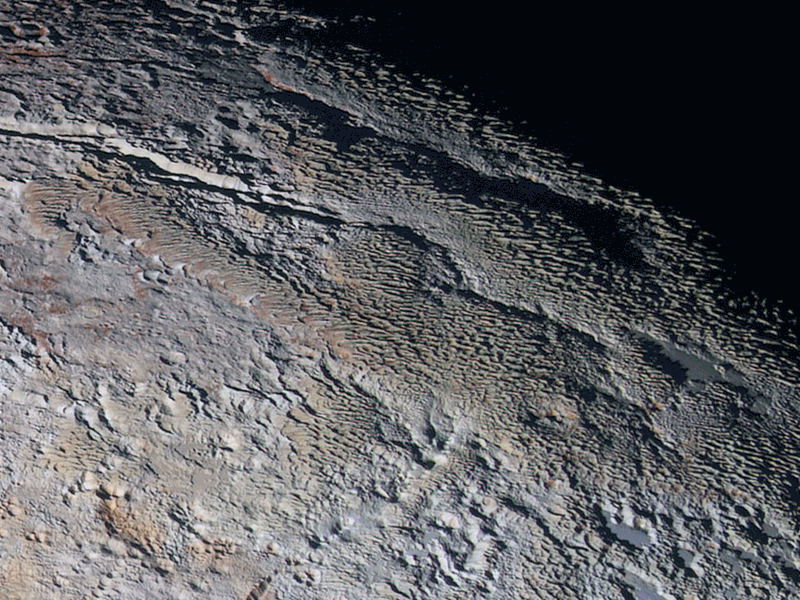 Pluto has some canyons that appear to have formed by stretching from below. Charon is far more dramatic, with a ring of great cracks around its equator. The working theory is that when Charon was younger and warmer, it had an original interior of liquid water that slowly froze. 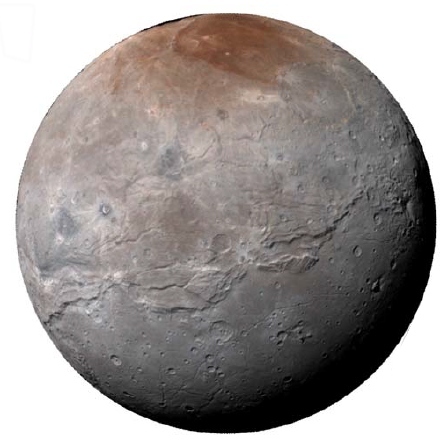 Because water, uniquely among common substances, expands as it freezes, the results might look like what we see today on Charon. Pluto and Charon are also colorful, ranging from the blue of nitrogen ice to the reds and browns found in Charon's great north-polar basin, Mordor Macula, and Pluto's ancient Cthulhu Regio. The reddish material appears to be a thin crust of organic crud, chemicals called tholins that are made from methane ice by space radiation. As we all know, Pluto is no longer officially called a planet. Speaking as a geologist, I don't like this, because Pluto exhibits the basic geologic behavior of a proper planet -- it's round, it's differentiated inside, and it's active. Nevertheless, the astronomers decided 10 years ago that Pluto is not planetary enough. It's too small for its gravity to have cleared all the cosmic debris from around it, and it has neighbors in that part of space that are the same size and even larger. So Pluto is a dwarf planet. But the authors of the Science papers have done better by calling Pluto and Charon "worlds." Studying a world like Pluto takes the wide-ranging skills of a large team of scientists. They may find analogies for something on Pluto existing on Earth's glaciers, in various parts of Mars, or on any number of the icy moons of the outer planets. The pitted terrain on Sputnik Planum's glaciers, for instance, looks a lot like the "Swiss cheese features" seen on the carbon-dioxide ice caps of Mars. The promise of exploring these analogies is that what we learn on Pluto may shed new light on other worlds, even our own. The work uncovers holes in our knowledge -- for instance, we know very little about the mechanical behavior of solid nitrogen or methane ice. But now that we know this knowledge matters, we can do some decent experiments. Thus a project like New Horizons not only challenges researchers to find new ideas, but also sends them back to obscure basics that are suddenly world-changing matters.